Hi folks. I hope everyone had a peaceful, relaxing (as much as possible) holiday. I returned to my home state of West Virginia to visit my family and to drink in the beautiful, haunting and stunning landscape. Needless to say, growing up in Appalachia left many lasting impressions on me–far too many to get into here–but the mountains, trees, fog, low-lying clouds, and winding, isolated roads are in my blood and when I return, I am truly home. The Reformation of Marli Meade is set in rural Appalachia and the landscape evolved during the writing process until it became a character all on its own. If you can’t travel to Appalachia to see Mother Nature’s finest work, then grab a copy of The Reformation of Marli Meade. I hope I did the area justice. My latest novel, a young adult thriller, is available for preorder on most venues and will be released December 1, 2016. Born and raised on an isolated Appalachian mountain, sixteen-year-old Marli Meade yearns to break free from her father’s puritanical church, but fears its cult-like clutches are so deep she may never escape. When she meets local boy Nate Porter, though, she realizes the life she craves—to be a normal teenager—is worth fighting for, even with the grave and deadly risk that fight would entail. As her two worlds collide, exposing buried church secrets more sinister than she imagined, and unknown facts about her mother’s death, Marli must decide if she has the courage to fight for her future or if time has run out on her chance to live. The novel is available on: amazon, Barnes and Noble, Kobo, and iBooks in eBook and paperback. I will be releasing excerpts from the novel this week leading up to release on Thursday. Hopefully they will entice you to give Marli’s story a try. Many thanks to the fab team at Blue Harvest Creative for creating another stunning cover. Here is the pre-order link: Marli Meade Pre-Order. When I first thought of this title, I thought it would be: On Being an Introvert and NOT Suitable for Human Consumption. But we’re not cannibals, so I decided that wasn’t the right word and I changed it to Companionship. Or was it the right word after all? I don’t mean that I think people will physically devour me, but when I am in a social situation, my fight or flight syndrome (quite well-honed after all these years, and quite potent), kicks in and I might as well be covered in vegan barbecue sauce with the world nibbling away at my sour self. Last night we had two couples and their children over for the Super Bowl. These are good friends, one couple whom we see on a regular basis, the other couple pretty consistently. But all day leading up to the little party, I was on edge, grumpy and feisty. I cleaned and straightened the house and grocery shopped and cooked. My kids were well-behaved. My husband helped. There was no reason to be on edge. No reason other than I have pretty significant, and deeply-rooted, social anxiety. I love silence. I love to be alone. I struggle with nearly every social situation I encounter, planned or otherwise. And though I initiated the party and was excited to hang out with friends, I was still anxious. What did I do? Had a few too many glasses of wine, a typical coping mechanism of mine to loosen the lips and reduce the anxiety. The problem was, I loosened them a little too much and spewed nonsense and personal details and all kinds of strange and unusual things. I interrupted others’ talking, forced words out of my mouth in rapid-fire profession, and had nightmares all night about how I must’ve come across. Sometimes I don’t see how I have friends at all. But I do because they’re awesome people who don’t seem too put-off by the manic energy that pours off of me in social situations. And thank goodness for them. I wish my inner introvert could understand that I am not going to be devoured and consumed by social interaction. People are not going to destroy me. People are kinder than that. But as an introvert with social anxiety, I can’t always make my logical thoughts translate into my feelings and being the type of person I am, feelings control my actions. Not logical thoughts. Wow, it’s fun to be me. What about you? If you’re an introvert, do you have social anxiety? Do you feel like conversing and mingling with others taps into your fight or flight syndrome, making you act like a crazy person? Do you feel like you’re being devoured? Consumed? How can we, as introverts, maneuver our way through social situations without feeling like parts of us are being chipped away? It’s all internal anyway. So, what do we do? For one thing, we can surround ourselves with understanding, compassionate friends. I am blessed to say I have these. I may have been annoying last night, or obnoxious, or irritating. But, these are my friends and I have a feeling they will forgive, forget, and return again for another fun soiree. If you have an experience to share, I’d love to hear from you. Knowing I’m not alone is one of the greatest feelings I could ever have. On Being an Introvert and the Trouble with Hello. I haven’t posted in ages, it seems. Though I continue to weave my way through life on a steadfastly introverted path, I have been sharing my trials and tribulations with a therapist rather than on my blog, and that has been a great help. I hadn’t realized that a pervasive, simmering anxiety had settled into my soul until I was at the breaking point. So, instead of turning to blogging I turned to a professional. Haven’t tried it? I highly recommend. But seeing a therapist is not the point of today’s post (I can write on that later if interest sparks). Today’s post is about the trouble with Hello. Such a simple word but for someone like me, a loaded word that carries the weight of insecurity, social anxiety, the overpowering need to flee. To others this hidden turmoil can come across as rudeness. I promise, I am not rude, but the simple act of saying Hello (cue Adele’s husky voice), or the anticipation thereof, can send me shooting down side aisles, turning the other way before eye contact is secured, wishing I’d just stayed home after all. But people don’t bite. So why be nervous or distressed over saying Hello? For one thing I live by the illogical belief that no one knows who I am, that I am a shadow who moves through the world, not fully realized not fully recognized. People wouldn’t know me anyway and I’d just end up embarrassing myself it I said Hello. For another thing, a simple Hello can catapult me into a…wait for it…a conversation. A conversation! An interaction between two people that should be pleasant and fulfilling. Why would I be afraid of this? Because typical conversation can be difficult for me. I don’t like the physical act of talking-my throat literally feels like it swells. My mind races in a thousand directions my mouth doesn’t keep up with. Then I spend ages after said conversation reflecting on everything I said wrong. I’m such a fool is a typical feeling that lingers once I have moved away. The ill feelings that swell after a simple Hello can kick me in my gut and make me want to cower in a corner. But I forget a simple Hello can lead me down an unexpected path of happiness and contentment and fulfillment the likes of which I would not get had I retreated to that dark little corner. The truth is, I enjoy people. Catching up on our lives. Sharing our concerns, fears, recent happenings. I especially like to hear people’s good news. Last night I went to a party. My husband and I had been invited to this party for ten years straight. It’s a company party put on by one of our friends who also invites non-employees like us to revel in holiday cheer. But this party is large-300 people-and I had such a fear of hours of chit chat I always declined the invitation. Last night we went. And thank goodness we did, though at first I admit I was uncomfortable, looking the other way to avoid eye contact, sipping my glass of wine a little too quickly, hovering in the corner. But then…then…it happened. A friend who I see maybe once a year looked at me the same instant I looked at her. Eye contact was made. There was no aversion now because her face lit into a smile and she started over. Then…I felt nothing but joy. She not only knew who I was (remember my irrational fear I’m invisible? ), but she was happy to see me. Conversation wasn’t uncomfortable like I always fear it will be and then other friends who I rarely see popped over and that was seamless and pleasant as well. What was I afraid of? I don’t have any idea. I think the fear over thinking no one knows me, that I’m invisible, can be debilitating. Further, if I am recognized, the after-effects of an uncomfortable conversation can set the stage for all interaction going forward even when each interaction is different, unique, and like last night, enjoyable. Any small statement can ignite a pleasant conversation. Don’t be afraid like I am. Go for it! Throw that Hello out into the world and see what benefits you reap from it! New Release! 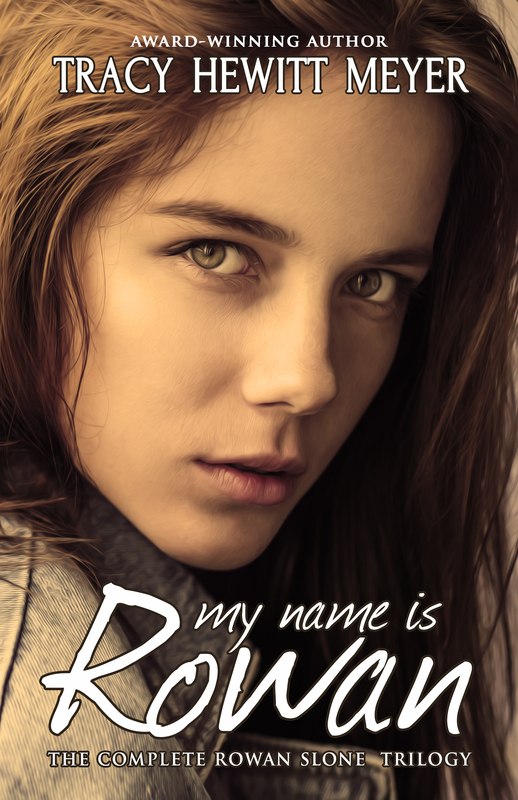 My Name Is Rowan is Available NOW!! Yeah! I’m thrilled to share that My Name Is Rowan—The Complete Rowan Slone Trilogy–is available now! Interested in discovering a new YA series that is perfect for teens AND adults? Try this award-winning series. Book #1, A Life, Redefined, won the 2014 RONE award for Best YA novel. Book #2, A Life, Forward, is a finalist in the 2015 RONE award for Best YA novel. The collection is complete with book #3, A Life, Freed. This trilogy is gritty and edgy and will take you on a roller coaster ride of emotion. Interested? Check it out and let me know what you think! I always strive to improve my craft and love hearing from readers. It may seem odd, but I do not like the physical act of talking. This goes deeper than social anxiety or introverted awkwardness (of which I have plenty). It is a real, palpable fatigue inside my throat, a sort-of throbbing weakness that reminds me that the simple act of creating words in my head that arrange themselves in my throat and exit my mouth in actual sound does not feel that good to me. I was talking to my mom the other day about how much I detest talking at the end of the night. Unfortunately, my hard-working husband often doesn’t get home until late and the end of the night is the only time we can catch up. But I’ve been surrounded by three children and their friends for the entire day. I’ve ran errands and made phone calls and talked to friends. By the end of the night, I’m done with talking. What I said to my mom was, “There are only a limited number of words that can come out of my mouth safely in a day.” What I meant was when my throat area starts to fatigue and I have grown tired of the physical act of talking, I start to shut down. Along the shut-down highway, my words get snarkier, ruder and all-around bitchier. I know this about myself and try to reign it in as much as possible. Unfortunately for the ole husband and children, any conversation after 9:00 p.m. can be wrought with sharp, bullet-like, clipped words shooting out of my mouth. I want everyone to go to bed so I can settle into silence. Ah, the bliss. But I have learned a couple of tricks, simple though they are, that help soothe my over-active throat, and help to keep my marriage going strong. A scarf wrapped snuggly around my throat, warming my skin and deeper. I find this soothing. 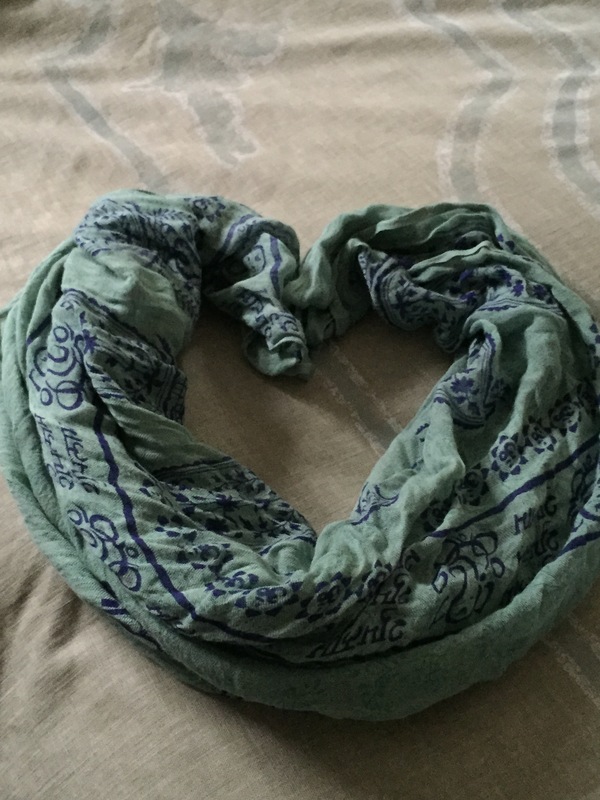 When I took a 4 hour train ride to RWA in NYC recently, I traveled alone (on purpose) and brought a scarf. I nestled into my window seat and wrapped the scarf around my neck, nurturing the area that would take the most abuse during a vibrant, brimming-with-people conference. On the train ride home? Same thing. It worked wonders. Tea. A warm cup of tea can internally do what the scarf does externally. My favorite tea-in-a bag variety is Yogi tea. 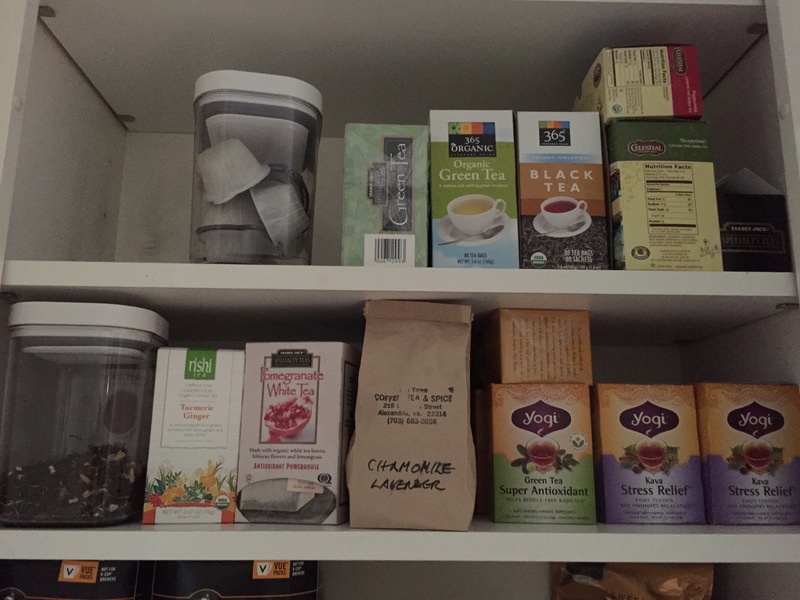 I also love loose teas. They smell divine. Fight for, arrange for, plan for long periods of silence-complete and utter silence where the lips don’t part (except to sip that tea! ), and the throat isn’t working in producing floods of words. I love silence. I love to sit in silence and be silent. When my three children are in school all day, I relish the days when I have no one to talk to (when there are no errands to run or calls to make). I make a point, on these rare days, to be silent–utterly and completely silent. It really does help. Does anyone else have a physical reaction to talking? If so, share your tips. I’m always open to new ideas! I’m thrilled to share that the entire Rowan Slone series is up for pre-order as a trilogy! Here is the cover for the trilogy, compliments of Blue Harvest Creative with their always-magical work! Well, it means that all three books are now available in one compilation. You can order them separately, or, now, together. If you pre-order the trilogy, you get it for a discounted price of $4.99. On the release date, the price goes up to $5.99. Further, $1.00 of each sale will go toward The Butterfly Project, an organization that strives to improve the self-worth of girls everywhere. This includes helping those who self-harm, something Rowan struggles with throughout her story. Want to know more about The Butterfly Project? Find information here: http://bit.ly/1KDE7A2. Where will the trilogy be available? Here is the pre-order link: http://amzn.to/1DeS4l4. The trilogy will also be available in paperback. Ready to discover a new award-winning series AND contribute to a great organization? Pre-order now!